The two degree climate change dangerous limit – a noble lie? Christopher Shaw, author of The Two Degrees Dangerous Limit for Climate Change, discusses the reality being masked by the attempt to limit global warming by two degrees. Edward Said did for Jane Austen when he highlighted the unspoken crimes of imperialism that financed the mansions in which her stories take place. But the literary critic Harold Bloom is having none of it. In his book How to Read he makes clear that the intelligent reader should have no time for such ideological critiques. After all, educated and literate people know only too well that social reality doesn’t bear too much scrutiny. How on earth would we get anything done if we insisted on pulling apart all the stories that make modern life ordered and intelligible? The necessity of not interrogating the assumptions and lies which sustain civilization may be all well and good in respect of trivial matters such as romantic love. But we should not continue to indulge comforting fantasies about the risks inherent in the proposed ‘solutions’ to climate change. Atmospheric levels of greenhouse gases are at their highest levels for 23 million years. The response from the world’s most educated and privileged groups? Keep adding greenhouse gases to the atmosphere. This policy is rationalised in press releases and official reports by the claim that there is a single dangerous limit to climate change for the planet (2 degrees Celsius of warming), we know what level of greenhouse gases will cause that amount of warming, and we will find a way to stop concentrations of greenhouse gases from breaching that level. None of these claims are true. The rate of warming, vulnerabilities to the impacts of that warming, and cultural assumptions about what is dangerous are too varied to be reduced to one number. The social reality which no one seems willing to face up to is that the 2C limit is an idea primarily designed to save modernity, not the planet. It is impossible not to imagine a future that deviates fundamentally from the trajectory of the current Western economic and social paradigm. That is why when unusual shapes were recently discovered around a distant star it was assumed it was some sort of alien structure for harnessing solar power. It is beyond us to tolerate the idea that there could be any other way of being in the world other than the historical path that has brought us to this current moment and will carry on for ever, delivering progress through ever larger and more powerful technological systems. While not doing anything about climate change is often described as ‘business as usual’, in fact it is the 2C limit which promises a future which is business as usual. The myriad impacts of a changing climate are reduced into a single dichotomous impacted/not-impacted scenario. Sources and sinks. Carbon budgets. The dichotomy articulated through these themes and metaphors invokes images of the climate system as a ledger, and the double entry book keeping method of accountancy. Thus is climate change transmuted into an economic problem amenable to management through cost-benefit analysis and the slow transition to a future the same as today, just minus the nasty emissions. Mainstream public discourses on climate change promise that this is the best of all possible worlds and that we can sustain this way of life without having to suffer greatly from the effects of climate change as long as we limit warming to 2 degrees, (or possibly three degrees, but definitely not four degrees). 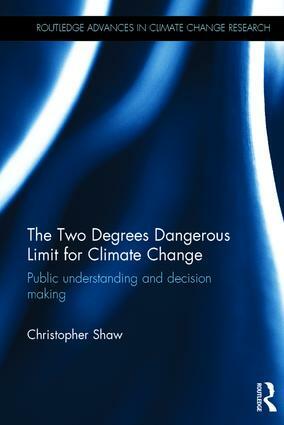 My new book The Two Degrees Dangerous Limit for Climate Change: Public Understanding and Decision Making offers a long overdue appraisal of the reality being masked by the two degree storyline. With world leaders trying yet again in Paris to build an agreement on limiting warming to two degrees it is more important than ever that the debate about what sort of future we want is opened up to as many people as possible. But we can’t base that conversation on a fairy tale. It is time to stop sugar coating the reality of climate change.